This is the leanest Sloppy Joe you will ever eat -- as a matter of fact, you will have to add oil to the latest recipe from this slim and cheapest of chefs. Sloppy Joe's are typically made with ground beef, and depending on the fat content, you will have a gallon of grease after browning the beef. So, not only is my homemade poultry Sloppy Joe Burger delicious, but it fits into almost any dietary regimen. Hi, I am The 99 Cent Chef and I am a tightwad. I seldom cook with $3 dollar per pound ground beef anymore. Since I created this blog in 2007, I've weaned myself off this artery clogging but oh-so-tasty protein and learned to love ground poultry. The kind I use is mechanically separated, and typically found in the frozen deli case for around a dollar per pound. It's more watery than fresh ground chicken (or turkey,) but I've found that it firms up fine during baking or sauteing. What's trickiest is cooking a chicken patty on a BBQ grill, but draining off most of the liquid -- and adding bread crumbs and chopped veggies in the mix -- will keep your chicken burger from seeping through the grating. My Ground Chicken Sloppy Joe Burger is loaded with flavor, using sauteed fresh veggies, pungent chili power, ground cumin, and brown sugar -- all in a thick sauce of tomato and ketchup. 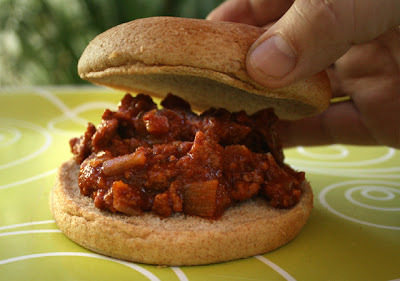 Upon the first bite of my homemade Sloppy Joe, you will flash back to your childhood: when Mom put the steaming meaty bowl of goodness on the dinner table, and you piled on the sloppy mess between a bun -- then dribbled it all over your fingers, while staining the front of your tee shirt, as you scarfed it all down as fast as you could. I used a pound of ground chicken for this recipe, so the end result will easily, and cheaply, feed your hungry brood -- just make sure to lay out extra napkins. You could conveniently buy a couple of cans of Sloppy Joe sauce, but you will still have to fry up some meat, so you might as well go the extra step and make my much more delicious homemade Poultry Sloppy Joe. And like two of my earlier video recipes, Beanie Weenies and Chicken Stroganoff, I used stop motion animation -- it makes following cooking directions so much more fun! Play it here. The video runs 3 minutes 18 seconds. 1 pound of ground chicken, turkey or beef - I used packages of cheaper, frozen (and thawed,) mechanically separated, ground chicken. 1/2 bell pepper - green, red or yellow, chopped. 1 tablespoon of garlic - chopped, from jar or fresh. 1 can of tomato sauce (about 15 oz.) 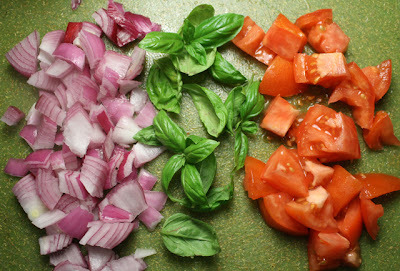 - okay to use crushed, whole or chopped tomatoes. Just break apart into smaller chunks when sauteing. 2 tablespoons of oil - 1 tbsp. for sauteing chicken, and 1 tbsp. 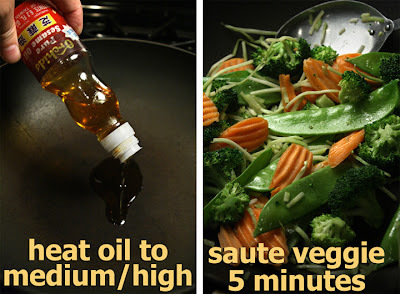 oil for sauteing veggies. 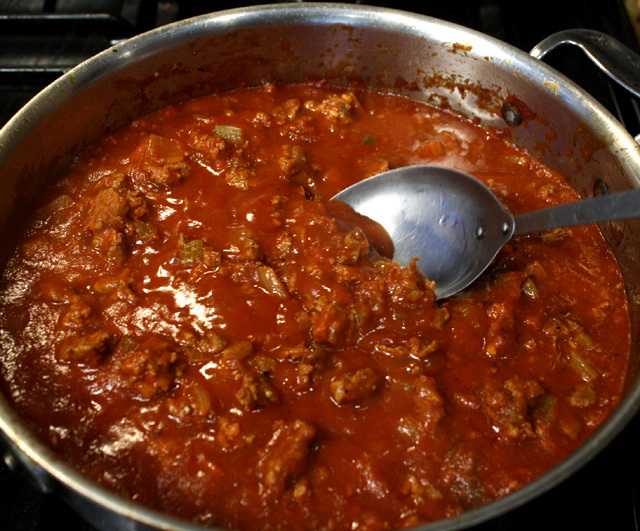 In a large pan or pot, add teaspoon of oil over a medium heat, then add ground chicken. I spread out chicken to cover bottom of pan and just sit back and let one side brown. You don't need to brown both sides. It should take about 7-10 minutes. 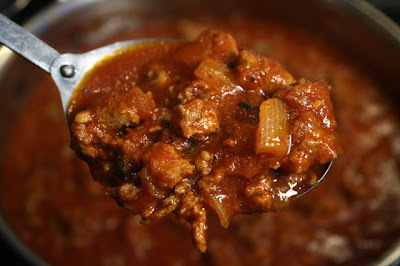 Turn over meat and break apart into bite sized pieces -- like you would for a spaghetti meat sauce. Remove from pan and set aside. Add another teaspoon of oil to pan. You can add chopped celery, bell pepper, onion and garlic to the same pan -- or you could have been sauteing the veggies, at the same time as the chicken, in another pan -- it's up to you. 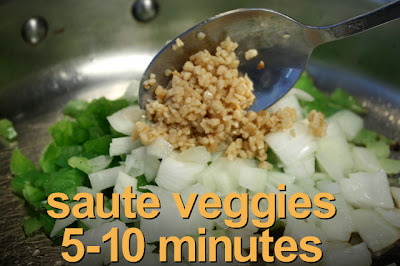 Stir and cook veggies about 5-10 minutes, until onions begin to turn light brown and caramelize. When veggies are done, add cooked ground chicken. Pour in a can of tomato sauce, a 1/4 cup of ketchup, and mix well. The final additions are the seasonings, including: Worcestershire Sauce, ground cumin and chile powder, brown sugar, salt and pepper to taste. Mix the Poultry Sloppy Joe sauce well. Bring to a simmer, then reduce heat to low. Cover and cook 10 - 15 minutes. Check during the last five minutes and stir. You want a thick chili consistency -- not too watery. Uncover and let sit a couple of minutes, and the sauce will thicken even more. Get out the hamburger buns and load them up -- but don't forget the extra napkins! I'm going for convenience and taste, for my latest budget recipe -- that brings canned legumes front and center. It's time to brush away the cobwebs and dust off those tins of beans in the back of the cupboard, and do something with them. Might I suggest a delicious Warm 3 Bean Salad with sauteed onion and tomato, and flavored with tangy vinegar plus luscious olive oil? I think you will be impressed with this simple, quick and satisfying side dish. 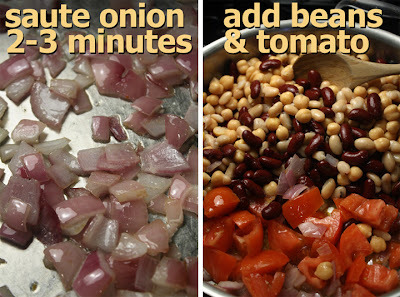 You can cook with any favorite beans you have on hand; just drain them and do a quick rinse while you are sauteing some chopped onion and tomato. You can try combinations of black-eyed peas, green beans, black beans, Navy beans, or pinto-- they will meld, but still retain their unique tastes. 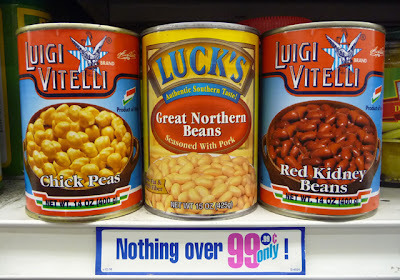 I always find cheap cans at the local 99c only Store, and even my chain grocery store carries some for around a dollar or less per can. And, ethnic markets have their own legume specialties on the cheap. Now, I know canned doesn't compare in flavor, or variety of preparation, to slow cooked dried, or fresh shelled -- but I'm trying to give you working stiffs, with too much overtime on the clock, a break, here. 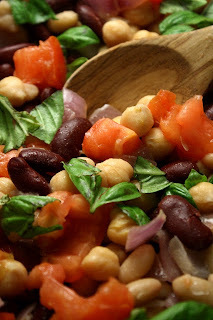 So give my Warm 3 Bean Salad a try. With all the time you save, you can start another load of laundry, or go visit your friends on Facebook! 1 large tomato - chopped. 1 medium onion - any type, including white, yellow or green onion. I used a red onion. 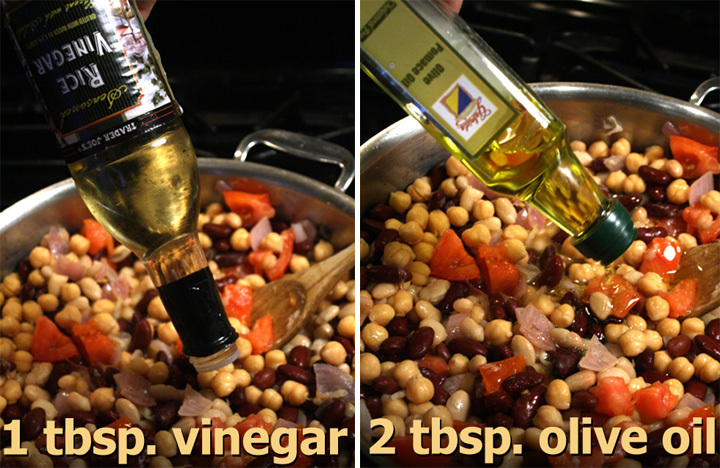 1 tablespoon of vinegar - I used rice vinegar, but you can use any on hand, including: cider, balsamic or white. 3 tablespoons of oil - one for sauteing, and another at the end, for flavoring. Open and drain 3 cans of beans. 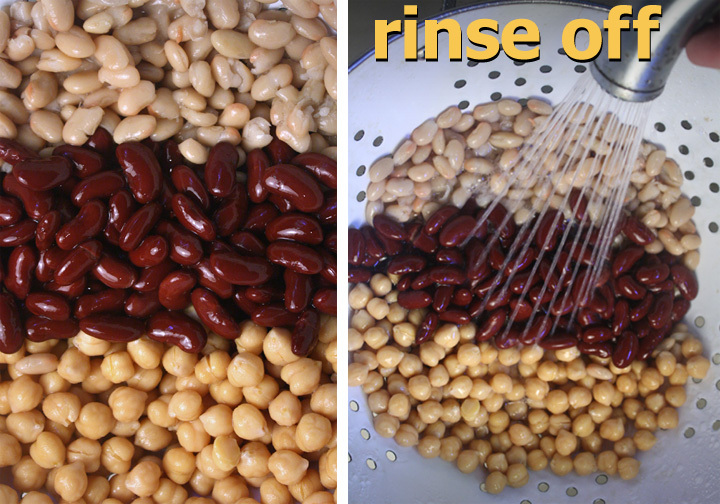 Add all the beans to a strainer and rinse off the rest of the bean sauce. Set aside and allow to finish draining. In a large pan or pan, over medium heat, add oil and saute onion until soft, about 2-3 minutes. It's just enough time to take out the hot raw taste and introduce some sweet caramelization. Next add all the beans and chopped tomato. Drizzle on a tablespoon of olive oil (or a favorite tasty oil,) and blend ingredients well. Cook until heated through, about 3 minutes. Finish by mixing in a handful of your favorite chopped herb. Serve warm (and easy to reheat in the microwave oven,) but okay to chill and serve right from the refrigerator, too. 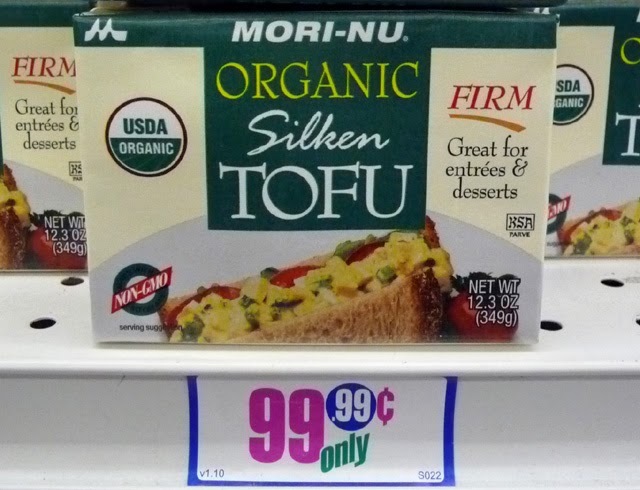 Tofu is boring, but not when The 99 Cent Chef gets his spatula under it! 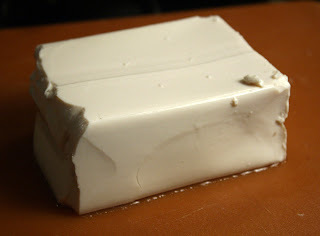 I give mushy tofu cubes some spine by coating, then sauteing in cornstarch. And, I add much needed flavor by mixing ginger into the crispy coating. I've done a Veggie Stir Fry before (click here), but over time I've improved that older recipe. It's time for version 2.0! Ginger, oyster and soy sauce, with honey, kick up the flavor profile to scrumptious heights. Tofu is cheap, too, even my local 99c only Store is stocking 12.3 ounce packages of it. And I've seen tofu at our local Trader Joe's for less than two bucks per container. So, since tofu has hit my price point, it's time to do something with it. And, the last couple of months, I've also found packages of a fresh Vegetable Stir Fry mix that includes snow peas, broccoli, and carrots. It's a perfect mix, and at 9 ounces it's enough to feed two. If you have local budget veggies, almost any will work in my chintzy stir fry. If you're uninspired by bland tofu, give my flavorful recipe a go. 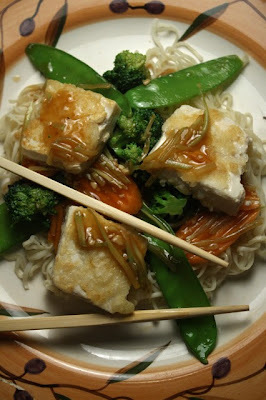 You can serve my Sauteed Tofu and Veggie Stir Fry over rice, or cheap ramen noodles (as I did this time). It's also tasty just by itself. I've added a new feature, at the end of this post, called Hindsight. Just some notes, changes or additions I would make to any published recipe. Sometimes, while creating and cooking a recipe, I think of improvements, or just a simple recipe tweak. I never make a recipe the same way twice anyway, so look under Hindsight to see any changes, or tasty enhancements, on this, and future recipe posts. 1 package of tofu - I used a 12.3 ounce pack. Use firm if you can get it cheap. 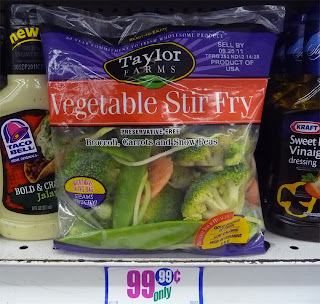 Vegetable Stir Fry package - I found a 9 ounce one. You could use frozen stir fry veggies, too. Or make your own veggie mix from locally grown, and on sale, produce - about 2 to 3 cups worth. 1 teaspoon of chopped garlic - fresh or from jar. 1/2 cup of Corn Starch - for frying tofu, and thickening stir fry sauce. 1 teaspoon honey - or favorite sweetener, optional. 1 tablespoon powered Ginger - optional. Okay to use fresh chopped ginger. 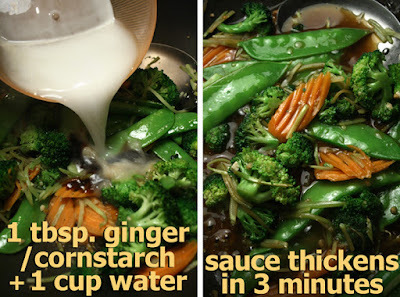 1 tablespoon Corn Starch/Ginger mix - added to stir fry sauce. If you are serving this dish over rice, then get it going first. You want to start heating your wok to a medium temperature. Add a tablespoon of oil; I used sesame oil but you could use regular vegetable oil. You want the oil to be hot when you add the tofu. Drain packaged tofu. Slice into about 2 inch cubes -- not looking for perfectly cut sizes. I got about 10 cubes. 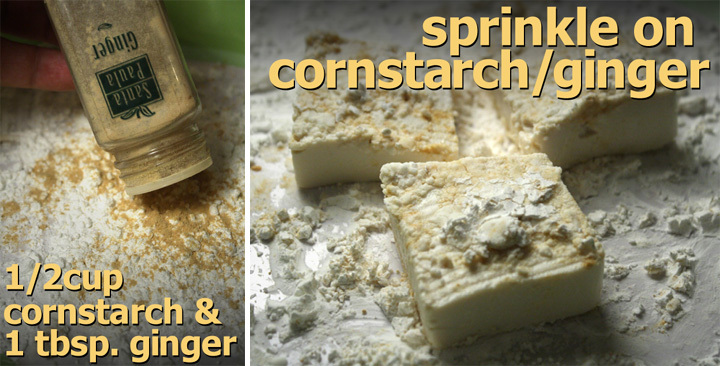 Spread out corn starch on a flat plate. Mix in 1 tablespoon of powered ginger (or fresh chopped.) 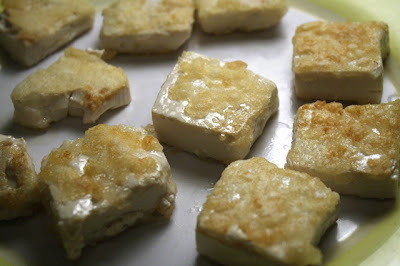 Carefully lay down tofu onto plate and spoon cornstarch/ginger mix onto top of tofu cubes. With a spatula or large spoon, carefully move coated tofu into the hot wok. I cooked it in two batches of 5 coated tofu cubes. Make sure the tofu cubes don't touch, or the crispy coating will stick, and pull off, when you separate tofu cubes. Once you place the tofu in the wok you don't need to move it around. 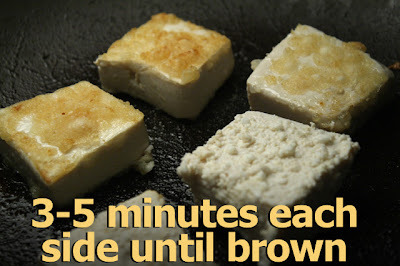 After 3-5 minutes, peek under a tofu cube to see if it is lightly brown. Turn over tofu cubes when one side is done, and saute for another 3-5 minutes. Move lightly browned tofu to a plate -- no need to drain off oil on a paper towel, as very little is used for sauteing. Add another tablespoon of oil if needed for the next batch of tofu. Repeat sauteing on each side for about 5 minutes, then carefully place on plate with the other tofu. If you are serving this entree over ramen noodles, now would be a good time to start cooking it. Add a tablespoon of oil to medium/high heated wok . Allow oil to heat up for a minute, then add your stir fry veggies. Continuously move the veggies around to cook all sides - for about 5 minutes. Next add garlic, mix well and cook for a minute. Now, time to blend the stir fry sauce. Add oyster sauce, soy sauce and honey. In a cup of water, or broth, whisk in 1 heaping tablespoon of the leftover cornstarch/ginger mix. Add the slurry to the wok and mix into the veggies. It should quickly thicken after about 3 minutes. Remove stir fry from heat. Assemble plate with noodles or rice, add veggies, then top with sauteed tofu. 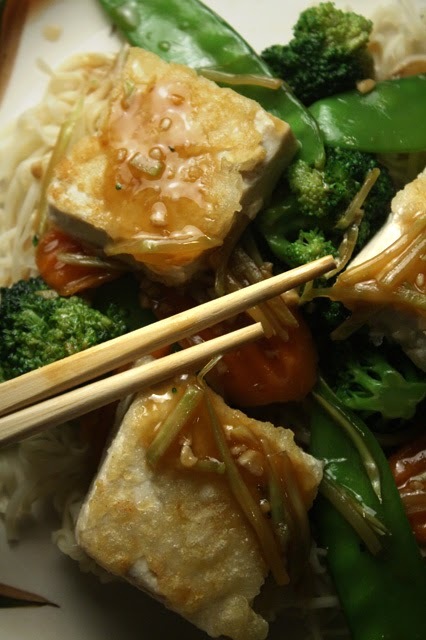 Finally drizzle some of the sauce on the sauteed tofu and noodles or rice. 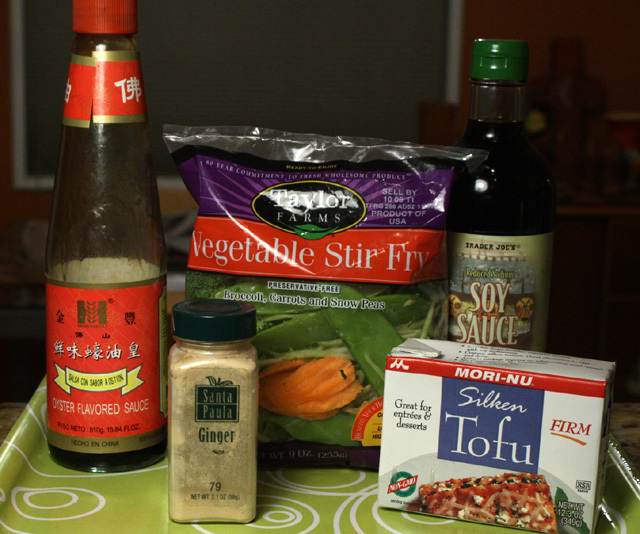 A few additions for mixing into the Tofu Coating include: a tablespoon of sesame seeds, chopped garlic (or garlic powder,) a dash of hot chile powder (or a minced hot pepper), extra ginger, or crushed black pepper corns. Sprinkle tofu with a few drops of liquid smoke. Mix some crushed peanuts (or any nuts) into the corn starch. Scrape off the zest of an orange or lemon for a fruity flavor to mix into the coating. For the Stir Fry Sauce, try adding a teaspoon of fish sauce. If you have a favorite premixed stir fry sauce, including teriyaki sauce, it's okay to use that instead. Chunks of canned pineapple (or fresh) is a sweet addition. San Franciscans like to trash-talk Los Angeles. 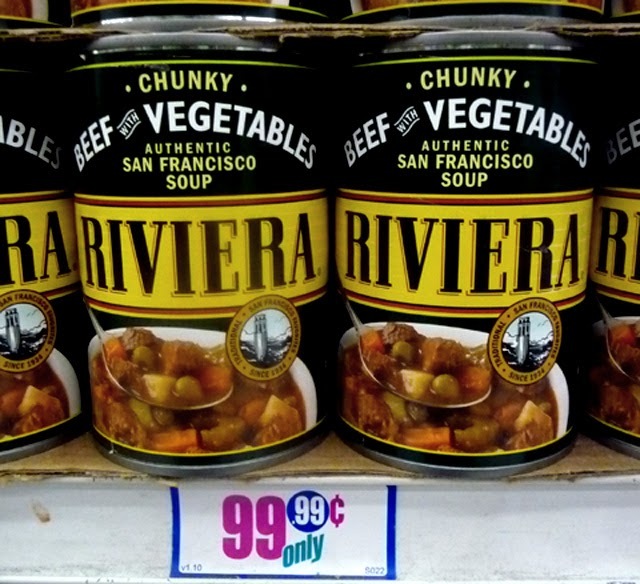 Well, this chef has a beef with San Francisco -- specifically, an "Authentic San Francisco Soup" made by Riviera called Chunky Beef With Vegetables. Actually, my beef is with the lack of beef in this anemic soup. In my latest Deal of the Day, I was looking forward to trying this seemingly hearty soup from my local 99c only Store. From the look of the can cover you would think this a meaty package. Well, just check out the photo below -- see, the average slice of "chunky" beef is as small as a grain of rice! Now, I'm not so naive as to trust a package photo advertisement, but this is ridiculous. "Since there is no there, there," to quote Gertrude Stein, I can't judge the beef part of this soup. Could it be that this one tin can was lacking? I don't have the money to waste trying to find out. The tomato broth is fine with an intense beefy flavor, and the soup has a thick consistency. The veggies are indeed chunky, although on the small side. And, as is the case of canned vegetables, they're on the soft, overcooked, side. 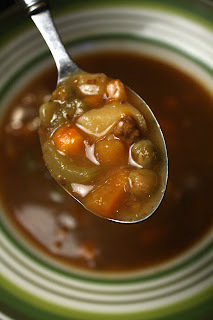 I did like the equal mix of potato, carrot, celery and green peas. San Francisco, your culinary reputation is tarnished with this namesake soup. 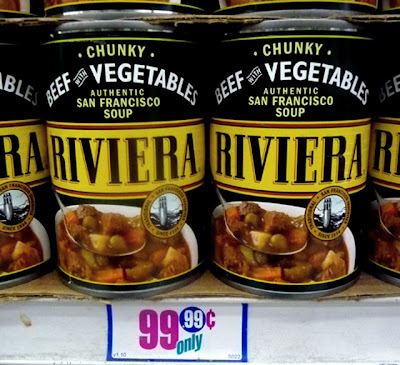 On a scale of 1 to 9, 9 being best, I give Riviera's "Chunky Beef With Vegetables, Authentic San Francisco Soup" a 3 -- any earned points are for the veggies. If you want something authentically San Franciscan, stick with a slice of Sourdough Bread and a Crab Louis! A cheaper and tastier twist on Beef Stroganoff, this birdy entree is plucked from The 99 Cent Chef's nest of recipes. Try it, and see how much scratch you save! The cheapest chef is too chintzy to use beef in his Stroganoff. Originating in 19 century Russia, this creamy meat sauce has spread all around the world, with adjustments to local tastes. I make my own cheap$kate adjustments that still keep this dish flavorful. 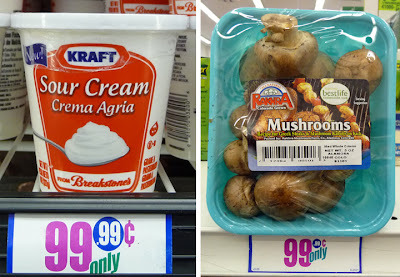 And sauteed mushrooms with tender chicken make a decadent sauce when sour cream is added. So, where's the beef? 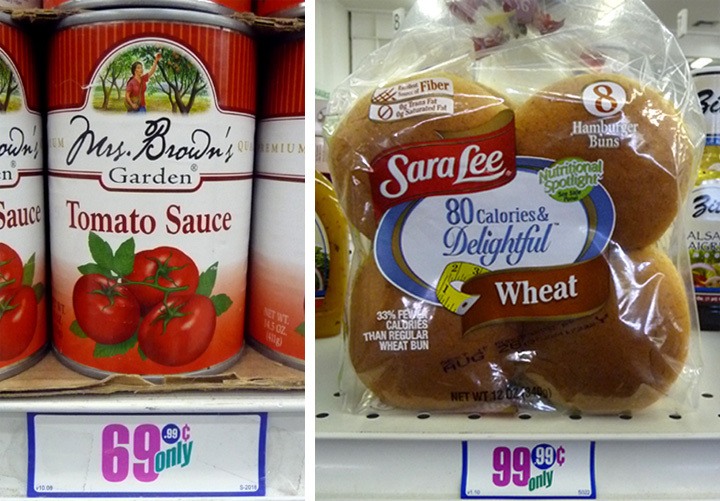 It's way over 99 cents per pound, and I've found that both chicken and ground turkey make a lighter and cheaper substitution. I've made a scrumptious Salisbury Steak with ground turkey; and a round steak Southern classic, Chicken Fried Steak, with real ground chicken! So, you see, it's easy to cut corners and still create delicious budget recipes. 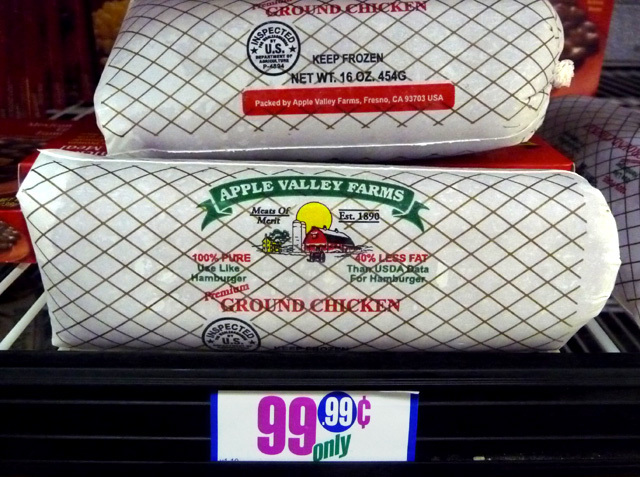 I often find whole (or split bone-in) chicken breast meat on sale for about 99 cents per pound. And, while this recipe calls for sour cream, you will only use 4 tablespoons, so you can get a small container. 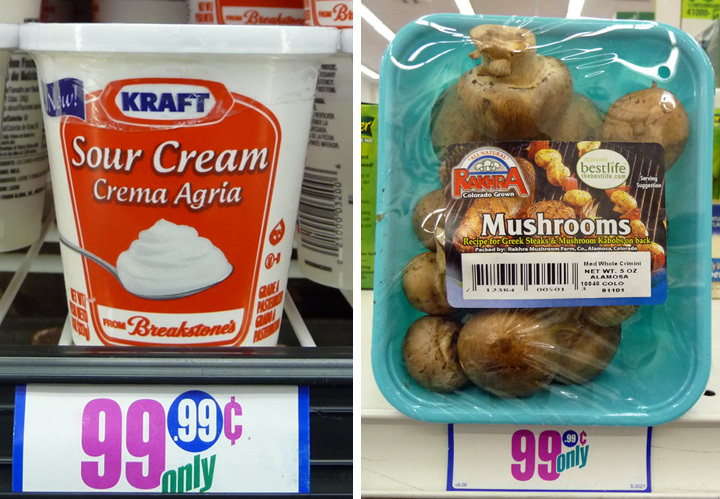 As for mushrooms, my local 99c only Store carries white button, brown Crimini, and large Portabella varieties -- and most regular markets have sale days, offering small packages of mushrooms for around a dollar. If you don't want to spring for a package, just get a handful of loose mushrooms for this recipe. 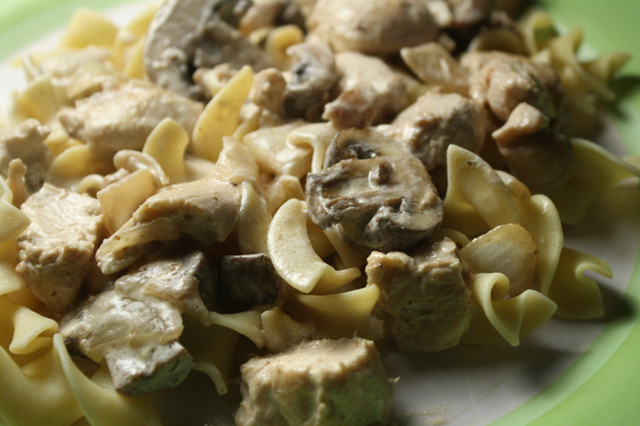 My Chicken Stroganoff is one lush entree. 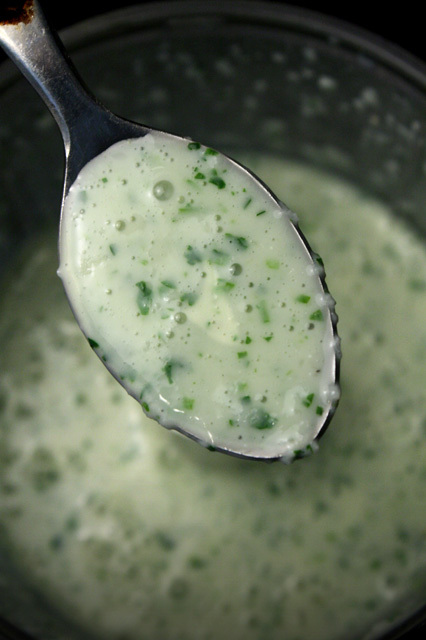 Some recipes leave out Dijon mustard, but you should use it if you have it - it adds a tangy level of taste to the cream sauce. I also used a small 99.99 cent bottle of white wine for some added sweetness -- you could substitute vegetable or chicken broth. 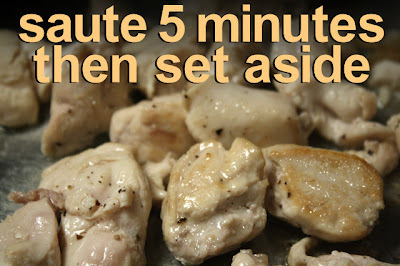 Another advantage of using chicken breast is that it cooks in a quarter of the time, and is much leaner. The typical cut of beef in a Stroganoff takes at least 30 minutes of simmering to tenderize. 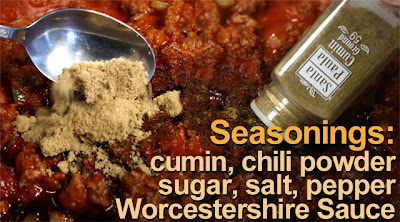 My video recipe below offers easy step-by-step instructions. 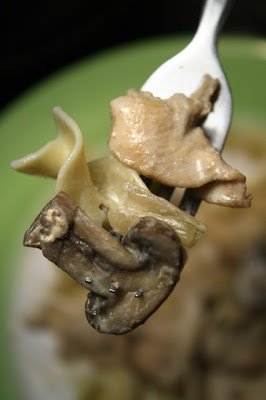 And, like my Beanie Weenies recipe from last month, I use stop-motion animation to amp up the visual playfulness: heaping spoons of rich sour cream - check; a line of dancing mushrooms - check; tender chicken breast meat peeled off the bone - check; animating chicken skin - yuck ! Play it here. The video runs 2 minutes 42 seconds. 1/2 to 1 whole chicken breast - cubed into bite-sized pieces. Okay to use dark meat -- it's harder to remove from the bone, but on the plus side, dark meat is cheaper. 4 tablespoons sour cream - lite or regular. Add more or less to taste. 5 ounce package of mushrooms - halved. I used brown Crimini, okay to use any local mushroom on sale. 1 whole small onion - white or yellow, chopped. 1 tablespoon of Dijon mustard - or regular mustard. 1 tablespoon of oil for sauteing chicken. Serve with Egg Noodles, pasta, rice, or steamed vegetables. Remove chicken and chicken skin from breastbone. Okay to discard skin, although I like to sautee it with the chicken meat for extra flavor (I would discard skin after meat is lightly browned.) Slice chicken meat into bite-sized cubes. Breast meat is easy to remove, just slice down the length of the center breastbone, and see how nicely the meat comes off. Heat a large sautee pan or pot to medium heat, and add oil. Cook chicken breast until lightly browned - no need to overcook it, as chicken breast dries out easily. Cook about 5 minutes, depending on heat. You will finish cooking it at the last step, when the wine and sour cream is added. While chicken is cooking, chop onion and mushrooms. I like to chop mushrooms in half, leaving the pieces large and meaty. 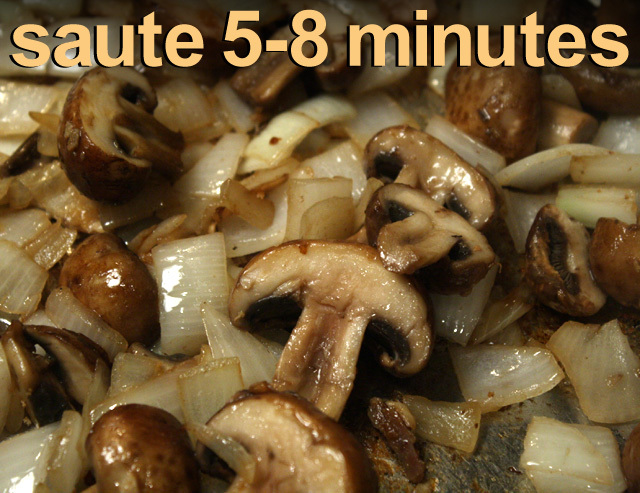 Remove chicken after about five minutes, and add onions and mushrooms to pan. Cook about 5-8 minutes, until onions are starting to lightly brown and caramelize. Add 4 heaping tablespoons of sour cream, mixing well. Finally add a tablespoon of Dijon mustard, or a teaspoon of dried mustard. Allow Stroganoff sauce to heat up to a low simmer - don't boil sauce or sour cream will curdle and separate. Cook at low/medium heat about 5-10 minutes until chicken heats up and finishes cooking. It's done when largest chicken piece is cooked through -- just slice into a piece to make sure there is no pink or red color. Stroganoff is traditionally served over eggs noodles, but white or brown rice is okay, too. I've also tried it over steamed veggies. Transparently thin pear slices are featured in the latest salad by the master of miserly meals. I've had a metal grater for forever, but seldom use the mandolin blade on the side. It's not quite long enough for wide fruit or some veggies, but works fine for my tart and tasty salad, which also includes spinach and a creamy herb dressing. Pears have been showing up at my neighborhood grocery stores for way below 99 cents per pound, in a lot of varieties, too. 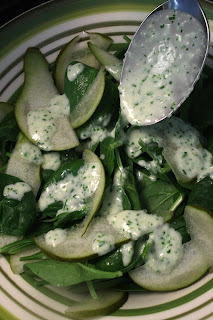 For my Pear and Spinach Salad I used pears that were firm, for easy shaving. 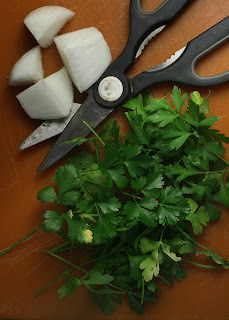 You could use soft riper ones if you prefer, but the mandolin might not work well -- so just slice thinly with a knife, or cut into bite sized pieces. I bought a package of spinach leaves at my local 99c only Store; even my local Latin market often carries one large bunch for a dollar or less. You can make a simple oil and vinegar salad dressing, or just use your favorite bottled one. But I would recommend you try my Creamy Herb Dressing. The herb part came from a parsley plant in my condo patio garden. You could also use basil if you have a plant. Or, if you are herbless, then a couple of green onions would be a tasty substitution. The cream base is mayo and milk that is sweetened with honey. It's a delicious dressing that you can make in under a minute in the blender. And substitute dairy with soy or almond milk and vegan mayo. I topped my fruit and veggie salad with crumbled cheaply priced Mexican cheese, queso fresco, but you could use feta, blue cheese or a little shaved parmesan. Although, this salad is delicious with or without cheese. For all my vegetarian visitors, this salad is especially for you. To keep things lactose free, substitute with soy milk and imitation mayo. 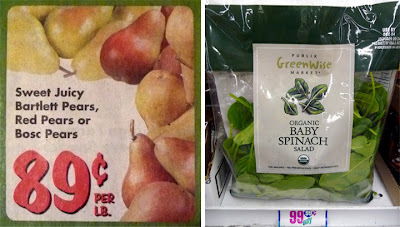 So for a light and refreshing salad with a pleasingly pungent and luscious dressing, try The 99 Cent Chef's Pear and Spinach Salad with Creamy Herb Dressing. 2 whole pears* - any type. 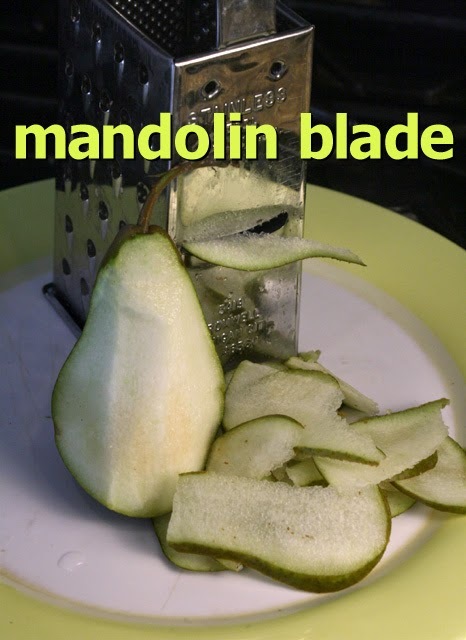 I shaved with the mandolin slicer on my metal grater, but you could just thinly slice or cube the pears with a knife. 1 bunch, or package, of spinach - wash well and remove large stems. Cheese (optional) - crumbled feta, queso fresco, blue cheese, or shaved parmesan. *1 teaspoon of lime or lemon juice (optional) - Drizzle over sliced pears to keep them from turning brown, if you are assembling the salad and storing it in the refrigerator for later use. 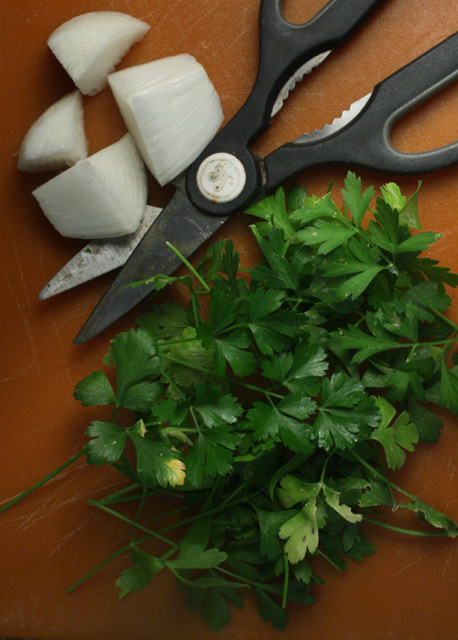 1/2 bunch of basil, parsley, or 1 green onion (roughly chopped.) You could also combine any of these. 1/4 small onion - if you are using 2 green onions, then don't use the 1/4 onion. 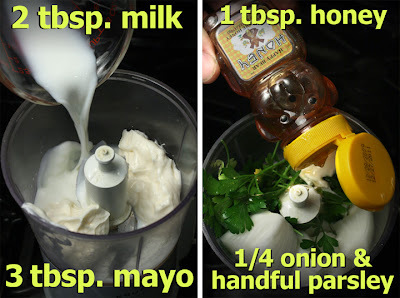 3 tablespoons of mayo - vegan mayo or plain yogurt. 1 tablespoon of honey - or a favorite sweetener. 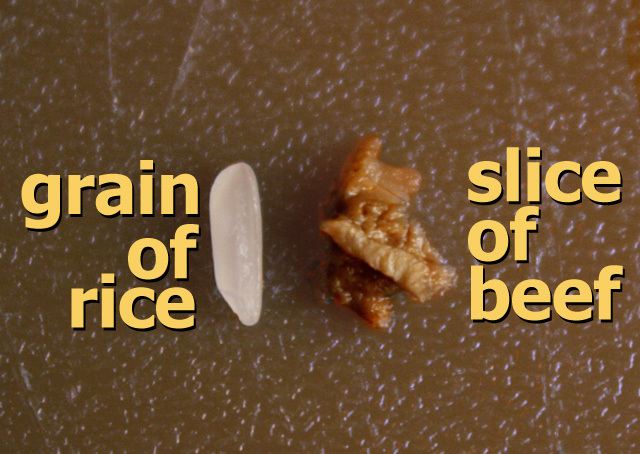 Chop onion in half (or small enough to fit blender, or food processor.) Add parsley (and/or basil) and onion to blender. Spoon in mayo (or yogurt,) then pour in milk. Add a teaspoon of honey or a favorite sweetener. Season with salt and pepper to taste. 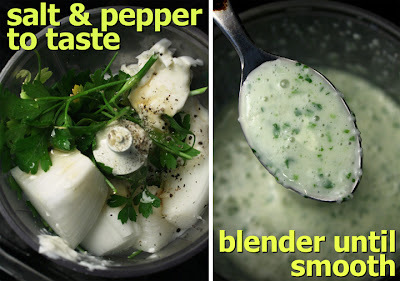 Blend until smooth like a salad dressing. Thinly slice pears using the mandolin blade of a metal grater -- if you have one. Make sure to stop shaving before you reach the bitter, light brown speckled, pear core. It's okay to just thinly slice, or cube, pears with a knife. In a large bowl or plate, mix together sliced pears and spinach. Crumble on cheese (optional) and finish with plenty of my Creamy Herb Dressing.